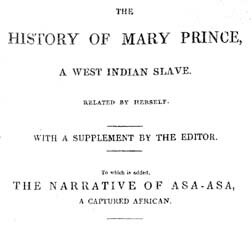 Mary Prince The History of Mary Prince, a West Indian Slave. Related by Herself. With a Supplement by the Editor. To Which Is Added, the Narrative of Asa-Asa, a Captured African. The History of Mary Prince, a West Indian Slave. Related by Herself. With a Supplement by the Editor. To Which Is Added, the Narrative of Asa-Asa, a Captured African. London: Published by F. Westley and A. H. Davis, 1831. Blacks -- West Indies -- Biography. Fugitive slaves -- West Indies -- Biography. Slavery -- West Indies -- History -- 18th century. Slaves -- West Indies -- Biography. University of Wisconsin Library, Madison, WI provided the text for the electronic publication of this title.